Duran Duran – Chain D.L.K. We just completed our first ROUNDTABLE audio interview with Simon, Nick and Roger. Fan feedback was so positive, we will definitely be doing another one. Listen here : Roundtable. Simon had a chance to present an Award at the Ivors. Read about it here: Simon at Ivor Awards. As you may know, Simon and Nick performed with Mark Ronson at Ronnie Scott’s in London. You can watch some of what they did on this cool behind-the-scenes video: Simon and Nick at Ronnie Scott’s. The band flew to Russia at the end of May to perform at a charity event. Check out some photos of Nick and John siteseeing and read about it here: DD in Russia. The band are back in the Studio with Mark Ronson, and expect to have new music for you soon! Watch what Roger has to say here: Roger Taylor Recording Update 2010. Have you been to the fan community lately? May brought us great exclusive Kafe’s from Nick and Simon, exclusive videos, and a cool giveaway! 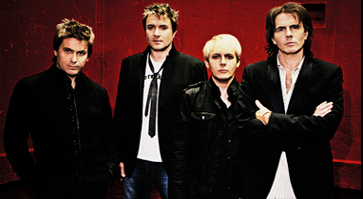 If you want to enter fun contests, win cool prizes and get access to member-only content visit the official fan community at Duran Duran Fan Community.